I am a relatively new but quite enthusiastic convert to Pinterest. One of my boards, naturally, is recipe ideas. I found an intriguing recipe for pork carnitas there. Carnitas are all about contrast. They’re traditionally made with a big ole hunk of pork that’s braised into submission, shredded, then fried over high heat in its own fat. The result is meltingly tender, spicy meat with crunchy bits scattered throughout. The original recipe is from Ali at Gimme Some Oven. She had the brilliant idea to do the bulk of the cooking in the slow cooker, then pop the shredded meat under the broiler. The slow cooker makes the dish easier; the broiler makes it healthier. Adding a little cooking liquid to the meat while it broils is pure genius: the chicken (or pork) becomes crispy without drying out. I wanted to lighten up the dish even more, so I used chicken thighs in place of the fatty pork. I’m always trying to add vegetables to any dish, so I tossed in a sweet red bell pepper. You could easily double the amount of chicken. I’d leave the beer the same, but boost the salt and chili powder a bit if so. Lessen (or omit) the Aleppo if you want a milder dish, or use what the original recipe suggests: chipotles in adobo. 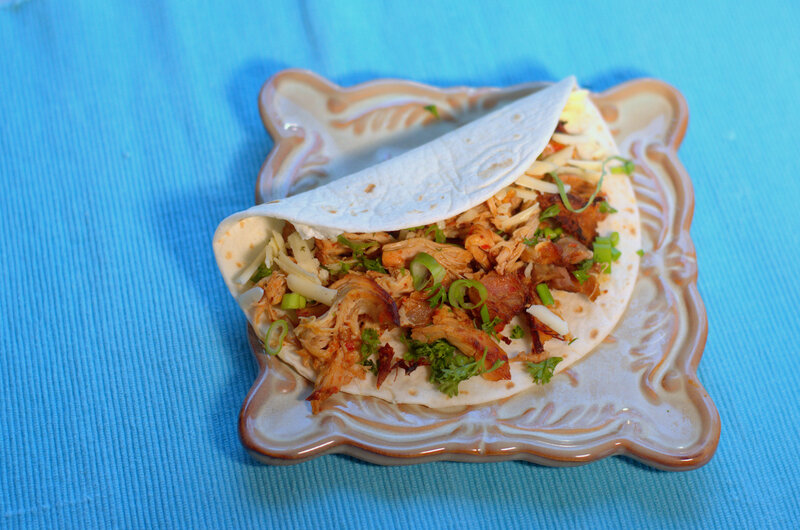 I’d make these also with a big hunk of pork — the classic protein for carnitas, although I’d probably trim most of the fat first. I’m thinking avocado slices would round these tacos out nicely next time. And there will be a next time. Heat the broiler and move a rack to highest setting. Remove chicken and some of the onion pieces to a large pie plate or small cookie sheet (I use the baking sheet from my toaster oven). Shred the chicken with two forks. Stir in some of the onion, and add a few spoonfuls of the sauce. Pour the remaining sauce and veggies into a saucepan and place over high heat. Bring to a boil and boil furiously to reduce to two-thirds or one-half of original volume. Use a stick blender to puree the veggies into the sauce. Shut off the heat and keep warm. Slide the baking sheet under the broiler. Broil for about 5 minutes until crispy bits appear. Pull out the pan and stir in about 1/4 cup of the sauce. Stick the pan back under the broiler for a few minutes until the chicken is both moist and crisp on top. Serve on tortillas with cheese, cilantro, scallions, sour cream and a drizzle of extra sauce. This entry was posted in main courses, meat, poultry,and fish and tagged chicken, chicken thighs, easy, low-fat, mexican, spicy, tacos, tortillas. Bookmark the permalink. This sounds yummy, and I like it as a general m.o. : broil after moist cooking. Cool!